Elegant Arts & Crafts oak writing table or side table with a drawer with pretty copper handle. This moves on four ceramic castors. Offered in excellent original condition. Height 73cms. Width 76cms. Depth 50cms. 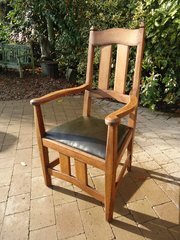 Lovely Arts & Crafts oak armchair designed by William Lethaby, Architect (1857 -1931). This has moulded and dowelled splats to the front and back with finials to top. Offered in good original condition with a newly upholstered seat in green leather. Minor damage to top of one finial. Height 115cms. Width 62cms, Depth 56cms. Arm height 71cms. Seat height 46cms. 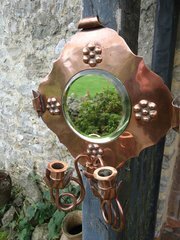 Arts & Crafts copper two candle holder sconce with a mirror to back which is bevelled. The candle holders are of a beautiful design and come apart for cleaning. The back plate has curled edges and four stylised flowers. Offered in good condition with very minor dings to top oof candle holders. Width 27cms. Height 34cms. Each candle holder has a height of 10cms and is 10cms deep. An usual Arts & Crafts book rack with two carved mythical birds entwined in a Celtic knot to both ends. To the side and on the front raised letters read in red. " Read these faint funes of mystery o ciet at home and o'er the sea. The bond is loosed, the poor are free. The worlds great future rests wit thee. Height 21cms. Width 42cms. Depth 23cms. Offered in good original condition. 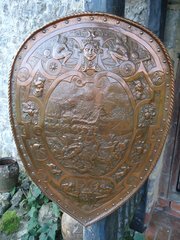 Fascinating large Arts & Crafts copper shield depicting battles, soldiers, vikings and all and superbly executed. The centre is raised and its has a twisted border. Height 61cms. Width 44cms. Depth 5cms. Unusual Arts & Crafts carved book stand that holds books on both ends and in the centre. Carved to front and back with birds amongst leaves and berries very much in the style of Arthur Simpson. It stands on four ball feet and is offered in good condition. Height 19cms. Width 51cms. Depth 20cms. Delightful Arts & Crafts Scottish school walnut cabinet after a style by George Walton. The window panels are each made of mother of pearl. 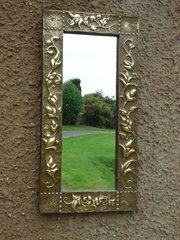 Offered in good condition with a width at the top of 73cms and 63cms at the main body. The height is 26cms and the depth 18cms. There is a key which opens the lock. 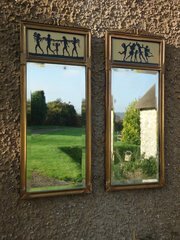 Pair of Arts & Crafts copper jardinières standing on three legs with claw feet. Reg mark 463904 for Joseph Sankey. Offered in excellent condition. Height 29cms. Diameter at top 30cms.. 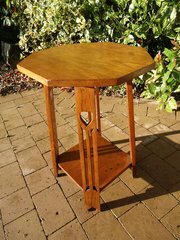 Pretty Arts & Crafts octagonal oak two tiered lamp table on four legs pierced with hearts. A lovely design. Height 70cms. the top measures 49cms. x 52cms. Offered in good condition having been stripped and refinished. 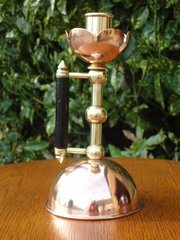 Arts & Crafts candlestick after a design by Dr Christopher Dresser made of copper and brass with ebony handle. This measures 18.5 cms in height and the diameter at the base is 9.5cms and is offered in good condition.